We are sorry you are in the position of considering the donation of your child’s autopsy tissue. No part of this journey is easy. 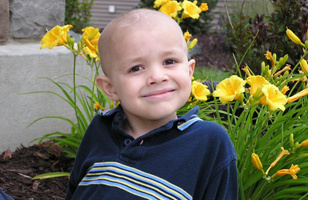 Our son, Zach, was diagnosed with medulloblastoma at the age of 4. He fought valiantly for three years. We miss his infectious laugh and sense of adventure, his gentle presence, and his beautiful soul. Zach’s battle ended after we tried numerous treatments. While he was undergoing treatment, we were very grateful for the trail blazed by kids who had been treated before Zach. We were very upset when we learned that most medulloblastoma research is done on primary tumor tissue. Scientists have recently shown that a cancer like Zach’s changes or mutates with each treatment. It is no surprise that there are no effective treatments for kids with relapsed medulloblastoma. We feel strongly that we need better treatments now. We don’t want any more kids and families to go through what we have gone through, desperately seeking a cure. Often times, we felt like we were blindfolded and trying to throw darts at a moving target. We hope that, with the tissue donation we made, the doctors will be able to develop better treatments for relapsed medulloblastoma. From the age of 3, Zach dreamed of being a scientist. We knew he would have approved of our decision to donate tissue if he had had the maturity to make the decision himself. We feel the donation of his tumor tissue is an important way for us to continue the fight against his cancer. It is a vital part of his legacy. Some people are able to give a lot of time and money to fight pediatric cancer. We felt we were able to give the scientists something few people can — potentially lifesaving information. When the war against his cancer is won, we will claim part of the victory in his memory. Once we decided to donate, we just gave our doctor a list of researchers to whom the tissue needed to be sent. Kids v Cancer has compiled this information for you, or you can ask your oncologist to make this decision, based on Kids v Cancer’s Research Page, without your input. We did not have to do any additional work, or pay any additional fees. In the seven years he was here, Zach touched countless lives. He will continue to do so in perpetuity, because of this final gift.